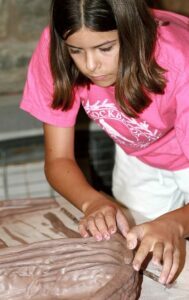 The Rockbrook pottery program continues to be a very popular activity at camp. Both pottery studios always seem to be humming— girls sculpting, pressing or decorating something, and instructors zipping around to give pointers, prepare materials, or plan a kiln firing. All this action means that there are some pretty cool things being made too! There are multi-colored tiles, sculpted miniature animals, giant coil pots (like the one in this photo), and delicate wheel-thrown cups and bowls. One really cool project is to take a smooth flat slab of clay and press natural forms into it so that they leave intricate textures. Little twigs, leaves, and tree bark, for example, all leave amazing patterns. You can then use the slab to make a vase or some other vessel. It’s easy to see why the Rockbrook summer pottery program is so well loved. There’s almost an endless variety of pottery projects to make, great satisfaction seeing how they turn out when glazed and fired, and the fun of being with your friends throughout.